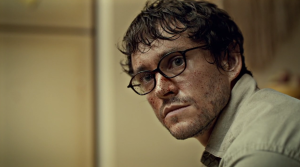 When we first meet Will Graham (Hugh Dancy), the protagonist of Bryan Fuller’s television series Hannibal, he is looking at the grisly aftermath of a home invasion, surrounded by FBI agents. 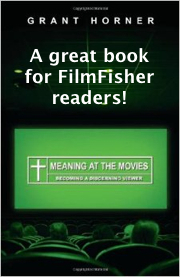 Graham, a special investigator, closes his eyes and, accompanied by the visual cue of a golden light sweeping the screen clean, reverses time, erasing bloodstains, removing agents, and bringing the victims back to life. He then proceeds to reenact the crime scene in his imagination, describing his intentions and actions to us in detail. Fuller then reveals that Graham is lecturing, describing the crime to a classroom full of students at Quantico. This is an instantly uncomfortable headspace in which to introduce an audience to the ostensible hero of one’s story. Dancy’s tortured performance makes it clear that Will takes no pleasure in imaginatively assuming the role of a murderer. The fact that our protagonist is so unsettled by what he is seeing and participating in encourages the audience to feel likewise. While subsequent episodes of Hannibal will aestheticize and beautify their crime scenes to fascinating effect, this opening is more clear-eyed – stark, ugly, and brutal. Based on Thomas Harris’ novels about now-iconic serial killer and cannibal Hannibal Lecter – most famously, Silence of the Lambs and Red Dragon, both of which have been adapted to film with varying degrees of success – Hannibal, with its dark, opaque style and elaborately gruesome violence, is an anomaly on network television. Much has been made of how the show’s existence on NBC was nothing short of a minor miracle, with critic Alan Sepinwall remarking, “I remain amazed that… Hannibal is even on television at all, let alone on a traditional broadcast network like NBC.” Unsurprisingly, despite near-universal critical acclaim, the series received consistently low ratings and was ultimately cancelled after its third season. The premises of Bryan Fuller’s previous series, Dead Like Me and Pushing Daisies, betray a fascination with death and the way mankind deals with its inevitability. Hannibal is similarly preoccupied with death and the effects of violence on the human psyche. In fact, it is more concerned with the emotional toll of chasing serial killers than the killers themselves. Unlike other shows of its kind – frequent points of comparison include The Following, Dexter, and Bates Motel – Fuller’s series avoids exploitative violence to deliver something more thoughtful, melancholy, and psychologically astute. Instead, it uses the contrast between Will Graham and Hannibal Lecter (Mads Mikkelsen) to seriously ask how one should response to the reality of violence. In “Aperitif,” Hannibal’s first episode, Alana Bloom (Caroline Dhavernas) and Jack Crawford (Laurence Fishburne) discuss the effects that working as an FBI investigator will have on Will Graham’s already unstable psyche. 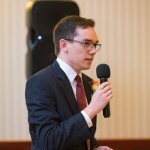 Jack speculates, “Will deals with huge amounts of fear. It comes with his imagination.” Alana clarifies, “It’s the price of imagination.” Throughout Hannibal, Will’s unique gift – a sort of unbridled empathy that allows him to get inside killers’ heads and understand their actions – is portrayed as a source of deep disturbance, manifested in increasingly unsettling visions and hallucinations. This is the key to the show’s success: that it sees the world through Will’s eyes. Grounding the story in Will as protagonist and hero is a large part of what keeps it from becoming exploitative or indulgent, giving moral context to the horrors on display. In many ways, Hannibal is not about Hannibal; relegating the iconic villain to a supporting role differentiates the series from the current trend of the television anti-hero drama, as seen in The Sopranos and Breaking Bad. Will may be deeply flawed, but he is fundamentally decent in a way that Tony Soprano and Walter White never were. Throughout the series, Will and Hannibal exemplify differing approaches to violence. In “Aperitif,” Will is deeply disturbed by the actions of Garret Jacob Hobbs (Vladimir Cubrt), also known as the Minnesota Shrike, who kills young women resembling his daughter. Hannibal, in contrast, is fascinated by Hobbs, even going so far as to emulate him. Throughout the first season, Hannibal’s actions – imitating the crimes of the killers he and Will work together to apprehend – earn him the nickname of the Copycat Killer. However, Will’s imagination comes with a high cost. As Crawford and Hannibal push Will more and more towards the darkness that mankind is capable of – unintentionally on Jack’s part, intentionally on Hannibal’s – he becomes increasingly concerned about his own capacity for evil. “It’s getting harder and harder to make myself look,” Will tells Jack in “Coquilles,” the first season’s fifth episode. “This is bad for me.” His ability to identify with killers makes him fear that he is capable of becoming one, and Hannibal attempts to push him towards this outcome. Empathy is highly prized in modern culture and art, but Will is faced with the possibility that unrestrained empathy can lead to compromise of his values. He uses his imagination to do good – Jack frequently reminds him that he is saving lives – but at the same time, it is a weakness that Hannibal can exploit. Will’s disgust with the murders he investigates is compounded by a fear that he will begin to enjoy and participate in the violence he witnesses. In the climax of “Aperitif,” Will kills Garret Jacob Hobbs, saving the life of his daughter Abigail (Kacey Rohl). Although most series would hardly blink at such a development – the righteous killing of evil men is typically celebrated without question in American culture – Fuller devotes a great deal of the series’ first season to dealing with Will’s internal fallout over his actions. He reveals to Hannibal that killing Hobbs felt good, and Hannibal, in turn, tries to nurture Will’s ability to be a killer. In an interview with Alan Sepinwall, Fuller explains, “Based on [Hannibal’s] philosophy of life, getting Will to accept the fact that he is a murderer and could take a life will actually help him become a purer human being.” This may be the series’ most vital dramatic and thematic dilemma: is Hannibal right about Will’s innate ability to kill, or is Will fundamentally good? From this question arises another: can immersing oneself in darkness change them, or does it merely reveal darkness that was already within them? In his review of Jonathan Demme’s film adaptation of Silence of the Lambs, Roger Ebert writes, “A fundamental difference between The Silence of the Lambs and its sequel, Hannibal, is that the former is frightening, involving and disturbing, while the latter is merely disturbing… The secret of Silence is that it doesn’t start with the cannibal—it arrives at him, through the eyes and mind of a young woman.” Similarly, presenting the series primarily from Will Graham’s point of view sets a respectful distance between Hannibal Lecter and the audience, placing his actions in a larger moral context. At the same time, Hannibal seeks to explore why people – both viewers and characters within the show – are drawn to its titular character. In doing so, it renders Hannibal Lecter attractive: he is urbane, sophisticated, and charismatic. Although Fuller is careful to remind the viewer of Lecter’s evil, he also seeks to involve the audience in that evil’s seduction of Graham. The unintended result is that, as with Walter White of Breaking Bad, some fans of the series idolize Lecter unduly, missing or ignoring the moral context responsibly provided by the author. 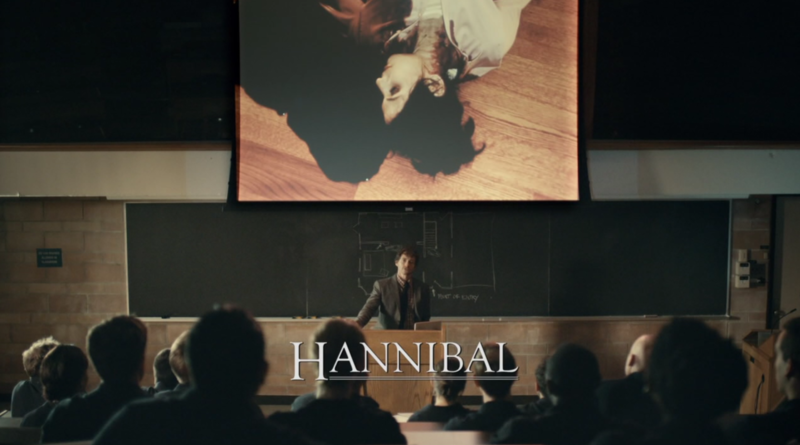 Early episodes of season three, focusing on Hannibal without Will’s balancing influence and delving into his backstory, may seem to lose the moral perspective that clarified Fuller’s view on the character in earlier seasons. However, Fuller is careful not to justify Hannibal’s actions through his backstory. “I accept what Hannibal has done,” Chiyoh (Tao Okamoto) tells Will in the season’s third episode, “Secondo.” “I understand why he has done it.” Will rightly replies: “Mischa doesn’t explain what Hannibal is. She doesn’t quantify what he does.” Later, Hannibal himself reiterates the point: “Nothing happened to me. I happened.” While another show might try to explain away an anti-hero’s actions by delving into his past, Fuller refuses to excuse Hannibal Lecter. However, at the same time, he humanizes Hannibal through Will’s interactions with him. As Will grows closer to Hannibal and begins to care for him, the audience follows him. The audience has a fuller understanding of the scope of Lecter’s evil than Will does, but is so immersed in Will’s headspace that they may sympathize with him. This unresolved tension – between the reality of Lecter’s evil and the sympathy and fascination afforded by Will’s perception of him – is present throughout the series, as the audience shares Will’s deeply conflicted emotions about Hannibal. One can view Will’s arc as a cautionary tale of how the subjectivity of empathetic perception can corrode one’s moral compass. While Will is characterized by his empathy, Hannibal is defined by isolation. This solitude is brought on by his own hubris; by believing that he is superior to everyone else, Hannibal forsakes the ability to relate to anyone. 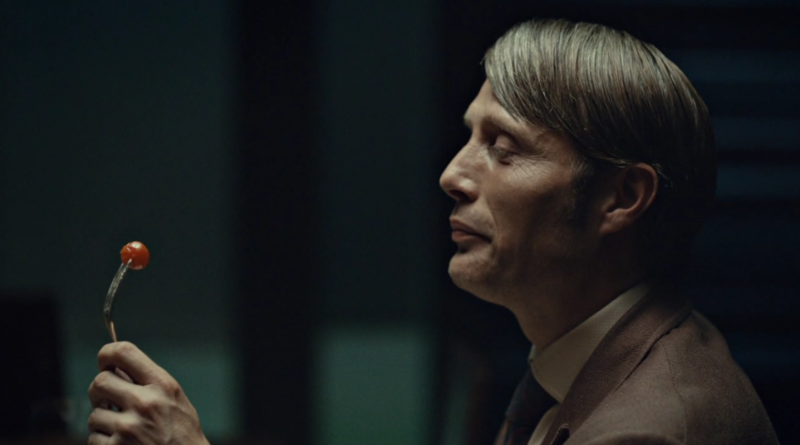 Early in season three, he coolly explains to one of his victims, “It’s only cannibalism if we’re equals.” However, Hannibal is fascinated by Will precisely because of his empathy. In Will, he sees someone who can truly know and understand him. His efforts to coerce Will into becoming a killer are rooted in curiosity – “You were just curious to see what I would do,” Will says upon discovering Hannibal’s true motives in “Savoureux,” the finale of season one – but also in a deep sense of loneliness. 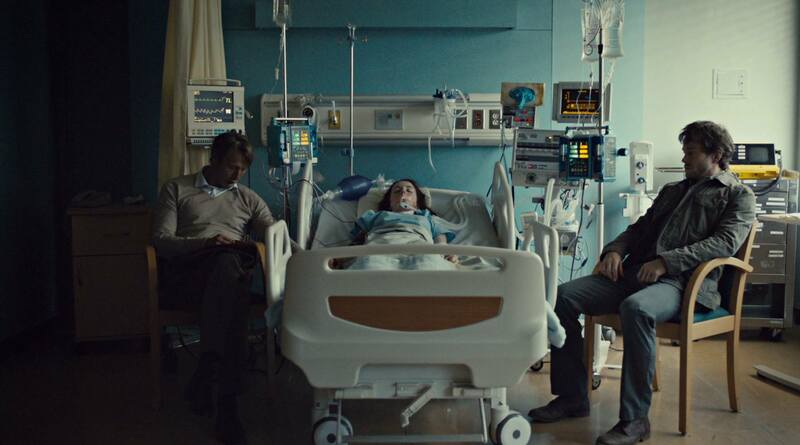 Throughout season one, Hannibal seeks to construct a sort of makeshift family, with himself and Will acting as surrogate fathers to Abigail Hobbs. His lack of empathy contrasts sharply with Will’s excess, but the two are drawn to each other, implying that neither mindset can function properly alone. Will must curb his empathy in order to block Hannibal’s influence, while Hannibal’s aloofness renders him haunted by isolation. In “Mizumono,” the finale of season two, Hannibal, visibly hurt for the first time, tearfully berates Will for betraying his trust: “I let you know me. See me. I gave you a rare gift, but you didn’t want it.” Hannibal is motivated by a recognizably human, universal longing: to be truly known by another person. However, he is simultaneously stymied by his own distance from anything truly human. Will’s empathy and Hannibal’s loneliness are both responses to perception of violence and darkness. The motif of sight and perception is highlighted by the recurring use of the phrase, “See?” The first occurrence of this line is in “Aperitif,” when a dying Garret Jacob Hobbs whispers it to Will. Later episodes clarify that Will is “seeing” what it feels like to take a life, and in this sense, shares a certain discomfiting kinship with Hobbs. The theme is hammered home in other ways – close-ups on eyes are a staple of the series’ visual style. Another striking example comes in the opening episode of season two, in which a killer arranges the bodies of his victims to create a massive human mural shaped like a giant eye. 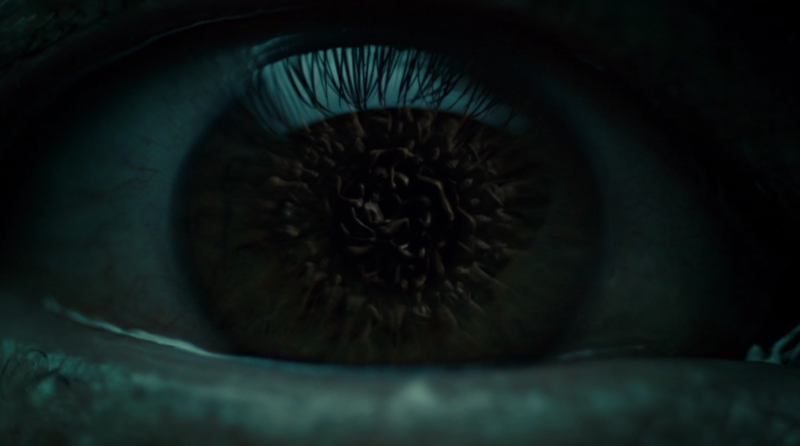 When Hannibal climbs to the top of the silo in which the mural is located, the eye stares up at him – a subtle but potent reminder of the dark things eyes look at in this series. Hannibal implicates the viewer in its questions of perception throughout its run, but nowhere more viscerally than in the second half of its second season. As Will returns to therapy with Hannibal in an attempt to expose him, the series itself becomes unmoored from reality, instead immersing the viewer in Will’s increasingly disoriented and emotionally confused mind through surreal imagery and atmosphere. In the opening episode of season three, Bedelia du Maurier (Gillian Anderson) intones, “You no longer have ethical concerns, Hannibal. Only aesthetical ones.” Throughout its run, Hannibal finds beauty in unlikely places, thanks to a lush visual style used by directors such as Guillermo Navarro, cinematographer of Pan’s Labyrinth. This ties into what may be the series’ most important theme: the fear of how one is shaped by what they see. By presenting violence as something aesthetically pleasing – as Hannibal does with his victims, preparing them as enticing-looking meals – Hannibal alternately entices and repulses its audience, prompting them to wrestle with their own responses to the darkness on display. Hannibal consciously recalls the way violence has been aestheticized in art throughout human history, pondering – often quite pointedly – whether or not the potential for evil is something innate to the species. Fuller and other members of the creative staff, along with television critics, have variously compared the show’s images to, as Vulture’s E. Alex Jung puts it, “Italian Renaissance paintings; Italian horror cinema, like Dario Argento’s Opera; Hélène Cattet; Bruno Forzani’s This Strange Color of Your Body’s Tears; Patricia Highsmith; and a ‘pinch of Alfred Hitchcock.’” The musical choices also emphasize the show’s emulation of and connection to classical art: Hannibal is fond of Bach’s arias. In season two, Hannibal mentions Homer’s Iliad, comparing himself to the epic hero Achilleus. Incidentally, Fuller’s casting of Hannibal in the role of epic hero is analogous to Milton’s portrayal of Satan in Paradise Lost, which adds further depth to the way characters frequently describe Hannibal Lecter as the devil – but that is beyond the scope of this paper. In the end, Hannibal’s incorporation of classical art is another way to get at its core thematic question: beyond the current trend of serial killer shows, why is human art so fascinated by violence and cruelty? Ultimately, Hannibal seems to suggest that art is a way to make sense of violence. In an interview with Alan Sepinwall, Fuller (2013) describes the creative process behind the show’s grisly yet beautiful crime scenes: “[we’re] constantly looking for, ‘What is the poetry of the murder? What is the art of the murder?’ …The more real the murder is, the less interested I am in seeing it. It’s hard enough to watch the news… [t]he only way to write this show is to give the villains a larger than life, operatic quality.” Fuller’s philosophy is to distance the violence of the show from reality in order to better process it and make sense of it by aestheticization. The danger is that aestheticization can belie the true weight of violence, and in turn entice the viewer into becoming a vicarious participant. This is the dilemma inherent in the show’s presentation: it simultaneously draws one in and warns them away. 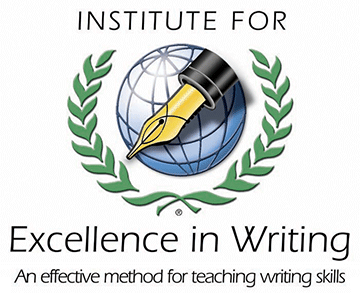 This is catharsis in its purest definition: the vicarious experience of, and release from, emotion. Yet, as Hannibal cautions, imagination comes with price. In its finale, Hannibal resolves the dilemma of violence and empathy in a catharsis that is deeply unsettling, suggesting that to immerse one’s imagination in violence is self-destructive and potentially inescapable. Will Graham and Hannibal Lecter, beset by the deranged killer Francis Dolarhyde (Richard Armitage), work together to murder their attacker. The act involves the audience in a way the show never has, finally coercing them into rooting for Will and Hannibal to kill. 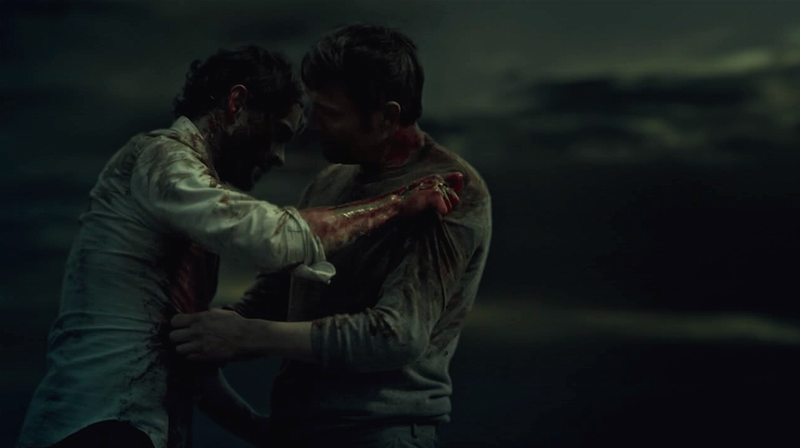 This bloodbath, as inevitable as it is cathartic, finally brings Will and Hannibal together, uniting the two opposites – but this mutually destructive union cannot last, as Will embraces Hannibal before hurling both men over the edge of a cliff to their presumed deaths. In the end, Hannibal is only able to resolve the conflict between empathy and violence by embracing both.